One of Dr. Ilana’s sweetest valentines is a little French Bulldog named Tristan. He stole our heart in so many ways– his infectious grin, questioning expressions, and sheer determination to enjoy life on his terms. 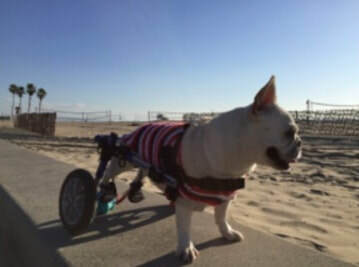 He had to undergo a hemilaminectomy in order to remove a ruptured disc that was compressing his spinal cord and that had caused sudden pain and paralysis to his hind legs. ​The operation was successful at relieving his pain but not fully successful at restoring his hind leg function, so Tristan came to see us at A Well Adjusted Pet seeking physical rehabilitation to retrain him to stand and walk again on his own one day if possible. Fortunately for this little guy, he has an amazing mom, Amanda, who was motivated to do everything she could to make sure he lived life to the fullest. Tristan has been regularly receiving physical therapy and has shown increased strength and ability to stand, sit, and urinate on his own. "Tristan’s doctor, Dr. Watt, and his team at VCA Vet Specialists did an amazing job taking care of Tristan but unfortunately bleeding and damage to his spinal cord caused him to have permanent paralysis. There was also some concern that Tristan had ascending myelomalacia, a condition that is most often fatal, and we were given a 12-hour window where Tristan would be monitored for this and we would wait at home devastated at the thought of a world without him. Fortunately our tough little guy did not develop this condition and we were able to take him home the next day. ​Although we knew we’d take Tristan home and care for him, it was stressful not knowing how much work it would be and how Tristan would adapt. What helped us cope were videos pet owners had posted of their own dog’s recovery from similar conditions and knowing one big difference between dogs and humans: dogs live in the moment. Their lack of long-term memory prevents them from dwelling on the past and getting depressed like we do. So began our journey of recuperation, rehabilitation and adjusting to life with a disabled pet. As soon as we could, we started taking Tristan to see Dr. Strubel at A Well Adjusted Pet, where he received laser treatments, acupuncture, and water treadmill sessions, and we were given exercises to perform on him at home. Over the next few weeks Tristan started gaining more strength in his back legs, he was able to stand on them for longer periods of time and to move around much easier. The best day came when we got his doggie wheelchair! As soon as we put him in his cart he starting running around and we could even see some subtle movement in his back legs. With this new freedom, Tristan could return to doing the things he loves to do – running up to the shore on the beach, chasing a soccer ball, and charming everyone that walks by him. We even took Tristan on a road trip to LA where we were met with excited and amazed faces as we strolled down the Santa Monica boardwalk. It has been five months now and we are forever grateful to his medical team – Dr. Watt at the VCA and Dr. Strubel at A Well Adjusted Pet and the Rex Center. We are also immensely grateful to have pet insurance and the peace of mind that the cost of Tristan’s care has never been an issue. But most of all we are grateful to Tristan, his sweetness and incredible resilience has not only touched our lives in the deepest way but also everyone who meets him."